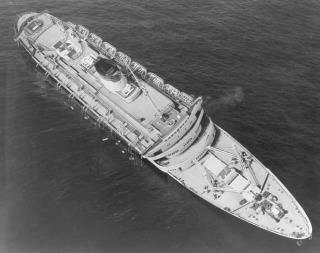 (Newser) – A 64-year-old man is presumed dead after he disappeared during a dive at the famed SS Andrea Doria shipwreck off the coast of Massachusetts. Officials say a fellow diver was with the man, who has not been identified, at a 20-foot decompression stop on Tuesday near the spot where the Italian luxury liner went down on July 26, 1956, report CNN and WCVB. When the witness reached the surface, however, the man was nowhere to be found. A commercial diving boat reported the incident to the Coast Guard, which was on the scene within three minutes, reports the Boston Globe. The Coast Guard last night called off the search for the missing man after scouring some 350 square nautical miles by air and sea over 30 hours. Too many factors to take into account on a dive like this. 240' is deep but still doable. Cold water isn’t a problem with the right gear. Low visibility can be overcome by experience. And a treacherous wreck in the middle od nowhere can be dealt with. But add all of these things together and you have a recipe for disaster. Nope. Esquire magazine did an issue about tragic places. The Andrea Doria was one of them. Any dive at more than 100ft. debt is no fun anymore. The Diver would need to breathe Trimix. Visibility is rapidly diminishing with increasing debt. Colors are changing and eventually what you see is just shapes with dark and darker shades of black. And to remove all the vestiges fun, there is the omnipresent danger of the Bends. Because of these reasons, I dive at most 60-70ft. where all the colors are vibrant and I could dive all day long without any fear from the Bends.